What’s better than staring at pictures of cats on the internet? How about a match-three game starring a cat that thinks he’s Indiana Jones? That’s the setup for Indy Cat on Facebook, PlayFlock’s colorful match-three game, which sees players completing puzzle levels to collect treasures with Indy Cat and his friends. Aside from its graphical theme, Indy Cat heavily resembles King’s Candy Crush Saga (among others), right down to the formation and function of its power-ups. Players create power-ups by making matches of three or more like-colored gems, or by creating matches in L or T shapes. 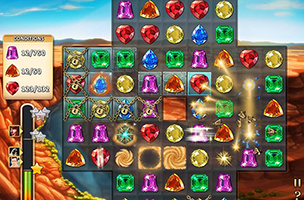 When matched, these special gems create explosions that clear whole rows, columns, or gem types from the board. Players also have access to a variety of premium boosts, including a whip for clearing single symbols from the board, and a boost for turning any gem into an explosive one. Levels have different board shapes and final goals, like earning a certain number of points, dropping special relics to the bottom of the screen or clearing shell tiles from the board, and players have a limited number of moves to complete all required tasks. At the end of each stage, players can compare their scores with their Facebook friends, and can replay stages to increase their high scores and climb the leaderboard. Indy Cat is available to play for free on Facebook and has over 571,000 monthly active users, according to AppData, our tracking platform for mobile and social apps and developers.